3M (St. Paul, MN) and Chesapeake Energy Corporation (Oklahoma City, OK) plan to collaborate in designing, manufacturing and marketing a broad portfolio of compressed natural gas (CNG) tanks for use in all sectors of the United States transportation market. 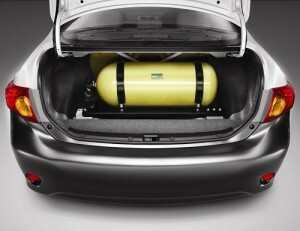 Currently the fuel tank on a CNG vehicle is its most expensive single component. The new plastics-intensive CNG tanks developed through the 3M and Chesapeake partnership will reportedly reduce costs while increasing performance. Less expensive tanks will enable greater market adoption of CNG as an alternative automotive fuel source. 3M’s CNG tank solution combines the company’s proprietary liner advancements, unspecified thermoplastic materials, barrier films and coatings, and damage-resistant films to transform the pressure vessel industry. Using silica nanoparticle-enhanced epoxy resin technology known as 3MTM Matrix Resin for Pressure Vessels, 3M plans to create CNG tanks that are 10-20 percent lighter with 10-20 percent greater capacity, all at a lower cost than standard vessels. In addition to these benefits, the 3M technology is said to produce safer and more durable tanks than those currently on the market. Increased political support and private investment have made natural gas a viable automotive fuel alternative with large growth potential. With more than a 100-year supply of natural gas in the United States and an average price per gasoline gallon equivalent of $1.00 to $2.00, the fuel is plentiful, affordable and domestic. The fuel also burns more cleanly than gasoline, cutting greenhouse gas emissions by 30 percent and particulate matter by 95 percent. Chesapeake has pledged an initial $10 million toward design and certification services, market development support and a commitment to use the new tanks for its corporate fleet conversion to CNG. The company’s investment will be provided by Chesapeake NG Ventures Corporation (CNGV), established in 2011 to identify and invest in companies and technologies that will replace the use of gasoline and diesel derived primarily from foreign oil. CNGV has committed $1 billion over the next 10 years to help fund various initiatives to increase demand for natural gas, including investments totaling $300 million in Clean Energy Fuels Corp. (Seal Beach, CA) and privately-held Sundrop Fuels, Inc. (Longmont, CO).